We had a great trip on the Cetacea today! We decided to head to the south to see if we could find anything different to the last few days. Not even on to the bank we spotted some activity on the perfectly clear flat waters. 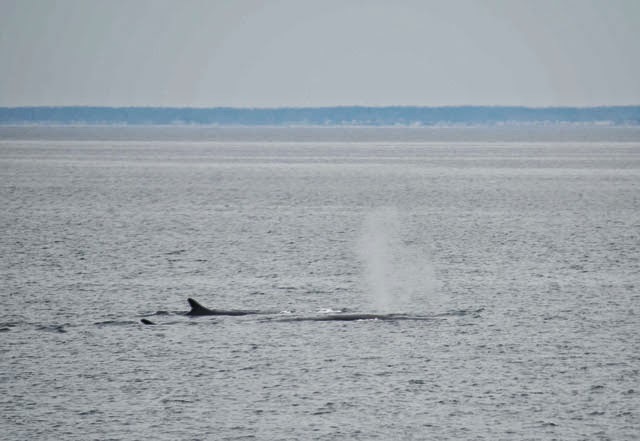 We spotted two animals but stayed off until we were able to identify whether we had humpbacks or right whales (Right whales are critically endangered and federal law requires a 500-yard buffer zone between vessels/people and the whales). In the meantime passengers got some great views of the animals diving and fluking. We moved off and soon found a pair of fin whales. These two animals gave fantastic views and stayed at the surface for 4-5 minutes after each dive, one even rolled on its side and gave a good look at the ventral pleats! This was definitely a pair. Our last look was of both whales on either side of the boat before they rejoined behind us. It was a great day out on the water for the beginning of the season.